Since opening in 1865, Hotel Café Royal on London's Regent Street has welcomed a variety of guests, from royalty and politicians to rock stars and renowned authors. The luxury hotel re-opened in late 2012 following an extensive refurbishment. Historic hotel overlooking Piccadilly Circus where Oscar Wilde held court. Artists including Augustus John, James McNeill Whistler and Aubrey Beardsley have dined there and, most famously, Oscar Wilde held court at Café Royal, a 160-bedroom 5-star luxury hotel on London's Regent Street, but in December 2012 the luxury hotel reopened with a complete redesign by David Chipperfield Architects. 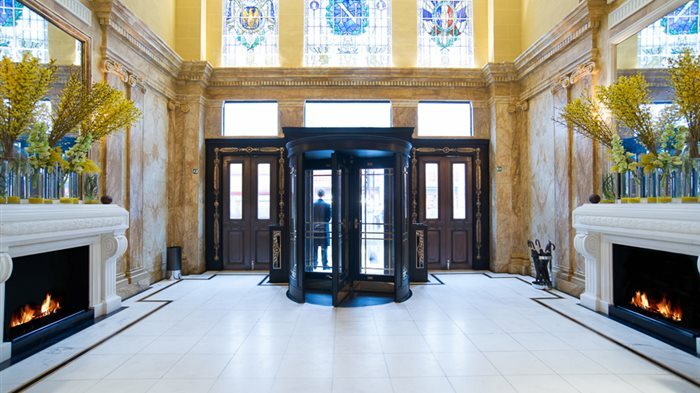 The existing Grade I listed Louis XVI interiors have been retained and improved, including the famous Grill Room, the marble Entrance Hall, and Domino Room. The hotel also has modern conference facilities, a street facing cafe, atmospheric dimly lit bar and restaurants to suit different tastes. The Akasha Holistic Wellbeing Centre, featuring a large lap pool, sauna and Hammam steam room, offers a range of signature treatments. The Ten Room offers British informal all-day dining in the heart of Cafe Royal hotel. The revival of the Ten Room within the historic Hotel Cafe Royal relaunched in 2012 following a major refurbishment, has given one of London's most renowned dining rooms a modern makeover. The heritage of this iconic landmark dates back to 1865 but now the Ten Room has been decked out in modern red banquettes surrounded by grey marble posts. Overseen by executive chef, Andrew Turner, the menu in the Ten Room combines traditional British dishes with contemporary flavours and styles. Menu highlights include Cornish skate and Challans duck breast. Welcoming both visitors and hotel guests, the Ten Room is open for all-day dining. Breakfast, lunch, cream tea and dinner are served, as well as an additional menu that features an edited selection of favourites available throughout the day and into late evening. The hotel also has an intimate and dimly lit bar and the ornate Oscar Wilde Bar formerly the iconic Grill Room where a traditional afternoon tea is served daily. The Grill Room within the Cafe Royal hotel, originally established in 1865, has reopened as a champagne and cocktail lounge with live entertainment complete with ornate Louis XVI decor. Reopened on 21st January 2013 as part of a major renovation of the Hotel Cafe Royal , The Oscar Wilde Bar is steeped in history. Formerly known as the Grill Room, the lavish restaurant within the historic Hotel Cafe Royal originally opened in 1865 and the ornate Louis XVI decor has now been exquisitely restored to its former glory. Of all the dining options at the famous Regent Street hotel, this room is particularly special. Oscar Wilde - after whom the restaurant is named - fell in love with Lord Alfred Douglas here, Aubrey Beardsley debated with Whistler, David Bowie retired Ziggy Stardust and Mick Jagger, and the Beatles and Elizabeth Taylor have partied in this very room, recast as a champagne and cocktail lounge with live entertainment. Menu highlights include: Scottish Lobster Cocktail, Sea Scallops (with truffles and hazelnuts) and Carpaccio of Angus Beef (with artichokes and white Balsamic). Dress code: "celebrative and sophisticated", in other words, dress up. Afternoon tea is served daily in the Oscar Wilde Bar from 2pm. A beautiful, calming space fronting onto busy Regent Street to enjoy tea and pastries. A striking presence on Regent Street, The Cafe at Hotel Cafe Royal is a beautiful, calming space to enjoy tea and pastries. With its interiors created from golden Sienna marble, The Cafe is a cut above your average cake shop. It's a swish place to enjoy a light menu of seasonal dishes presented alongside an espresso bar and counters lined with cakes, pastries and chocolates, created fresh everyday by Hotel Cafe Royal hotel's executive pastry chef, Andrew Blas. Hot drinks, cakes and selected dishes are also available to takeaway. Where a 19 metre indoor pool, warm water and Shiatsu massage treatments are combined. Occupying two floors of the Cafe Royal hotel, the Akasha Holistic Wellbeing Centre offers visitors a 19 metre indoor swimming pool, five treatment rooms and a variety of watsu hydro-experiences - where warm water and Shiatsu massage treatments are combined. The 1,200 metre squared wellbeing centre is divided between the lower floor, with large lap pool, private and public hammams, a dry sauna, wet room and a watsu pool. And the upper floor containing a yoga studio and gym, aerobics studio and a private training room. From cheap budget places to stay to luxury 5 star suites see our discounts for hotels, including Hilton London Islington Hotel from 68% off.